"Before the gateway of each newborn day, which holds within its sealed hours ordered responsibility, each morn I stand. I cry aloud: 'Lord of my life, how can I do the duty of this day and seek detachment? Meet every need and yet free myself from ties and bonds?' God said: 'The sun draws near and vivifies the earth. Naught can it take from out the earth. Live likewise. Give and ask naught!'" �I personally believe that [the Turin Shroud] is absolutely authentic, that it is the shroud in which the body of Jesus was wrapped after the crucifixion. The image on it was deposited intentionally and left there for future generations to hold to the reality of resurrection, because that is what the gospel story is about. The gospel story is not about crucifixion. It is about resurrection � The interesting thing about the Shroud, from my point of view, is how the image was made. �The Christ resurrected the body of the Disciple Jesus. When the body was laid in the tomb, the consciousness of the Christ, Maitreya, once again entered into the body of the Disciple Jesus and brought it back to life; not only that, but also Resurrected it. He shook loose, by the down-flow of tremendous spiritual energy into the now dead body of Jesus, the atomic particles of matter, reconstituted these, and brought into that body matter of sub-atomic vibrational rate, that is, matter which is literally light. 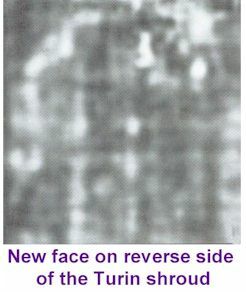 The effect of that on the body was one of intense radiation and it was that radiation which produced what is called an ionisation effect of the image on the Shroud. �There is a process in photography called ionisation. When a photographer wants to transfer a negative image to a positive image, or vice versa, he takes the plate and puts it under very high frequency rays � usually X-rays. The effect of this high-frequency ray bombardment is to ionise the plate so that when it is developed you get the opposite of what you would expect to find. Whatever should be light becomes dark, and whatever should be dark becomes light. The high spiritual down-flow from the Christ into the body of the Disciple Jesus caused the ionisation effect and produced a negative on the Shroud � and in this way it is, as it were, scorched on to the Shroud, but only on the surface. What happened to the Shroud after Jesus died? �Every computerization analysis of the figure on the Shroud has shown it to be 100 per cent accurate from every anatomical point of view, something highly unlikely if drawn by hand. The most conclusive proof that it is not a fake is this: it is a photograph, something quite unknown in the 13th century. �I am informed that the three groups dated their samples as from the 6th century AD, the 12th century and the 14th century, respectively. Discarding the 6th century result (as being too distant from the other two), they split the difference between these two and settled for the 13th century. Not, I suggest, either a logical or scientific method of approach. �A more logical � but still unscientific � result would have been reached by taking the average of all three findings, namely the 11th century. If, as I am informed, the present carbon-dating methods have a margin of error of 800-2,000 years, then one must �argue with the methodology of carbon-14 dating�. It is simply not accurate enough to be conclusive evidence of dating, and all three dates fit comfortably within the margin of error. Nothing is proved by this test one way or the other. �It has been suggested that the (spiritual) radiation assumed to impregnate the Shroud might have had some distorting influence on the carbon-14 tests, but I am informed that this is not the case. The testing technique itself is at fault. No one has ever proved (nor will be able to prove) how the image on the Shroud could have been faked � painted or drawn or somehow impressed by hand. It defies all such analysis and theories, and shows an awareness of the practical technique of crucifixion (for example, the nails are clearly seen through the wrist and ankle bones and not � as depicted in every religious painting to this day � through the hands and feet). �There is no doubt in my mind � nor, I would have thought, in the mind of any unbiased, objective observer who had really studied all the evidence � that this is the burial shroud of a crucified man. Crucifixion was a Roman form of execution and did not, thankfully, outlive the Roman era. This means, does it not, that the Shroud must be no more recent than the 4th century AD, a far cry from the Middle Ages. �If we accept that the Shroud is of a man crucified in Roman fashion, the question arises: why is this the only one of its kind? Many thousands were crucified by the Romans, and the bodies of many would have been wrapped in some kind of shroud. Why is this the only one to survive to the 20th century? I suggest it is precisely because of its unique image and unique origin. Because it is a photograph, a record of Resurrection.